Since the 1960s, strategies for the governance of sustainable development have been centred on the conservation management of habitats and species. The associated idea is that bottom-up community action plans must be at the heart of the new economic, social and environmental order. The conceptual linkage between culture and ecology is landscape and the theme of communities in landscapes provides the holistic planning and educational framework for behaviour change. Landscapes suitable to illustrate the theme are the relatively small valleys of the North Wales coast. Originally they were settled below an impassable mountain barrier as self-sufficient communities that harnessed the products of river, land and sea. They never participated in the 19th developments of the mineral wealth of coal and slate in adjacent places and tourism sealed their fate. Now, sandwiched between mountain and sea, they exemplify strategic and operational plans for engaging with local sustainability issues of biodiversity and post-industrial economics. 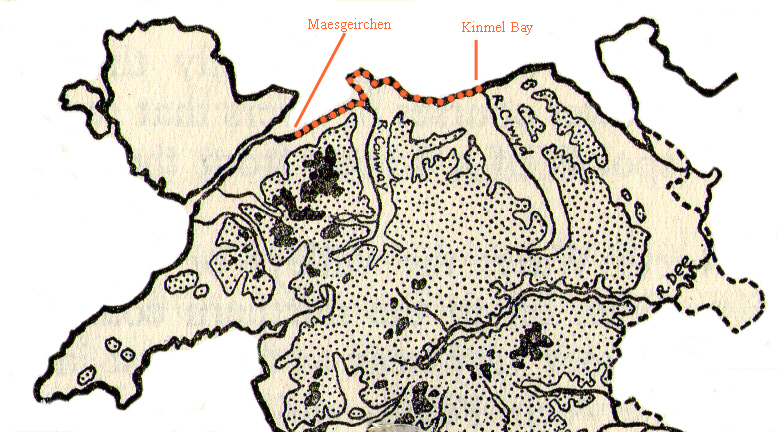 These issues in the maritime area of the Menai Strait and Conwy Bay were identified in the 2009 Making the Most of the Coast partnership initiative, which explored the practical application of Integrated Coastal Zone Management (ICZM) The natural resources of the study area, which comprise high quality landscapes, biodiversity and cultural history, support a wide diversity of commercial, recreational and other activities. Nevertheless, the coastal area is recognised as being socially and economically deprived due to its remoteness, high unemployment rates, and reliance on a narrow economic base. However there are numerous economic regeneration initiatives currently being developed regionally and locally. The upland area is where livestock farmers are the traditional guardians of the landscape and their activities can change the character of tracts of land by altering specific features associated with farming such as buildings, farm roads and tracks, and walls or fences. But land management can also affect the character of the wider landscape: reseeding, improved grassland, chemicals, drainage, and overstocking can all have a major impact on the semi-natural ecosystems. Glastir is the latest Welsh government scheme to pay farmers to meet the new challenges facing the upland countryside, such as water management, carbon capture and climate change, which the original support schemes based on reducing the grazing density of sheep and cattle werent designed to do. Ideas about a framework of governance of human-environment relations are traced back to Charles Darwin. His concept of natural selection suggested that certain social characteristics play a key role in human survival in the natural environment. This is the basis of cultural ecology, which involves communities interacting with social, environmental and biological factors to live in equilibrium with habitats and species, local and distant, upon which they depend for income, food, energy and shelter. The following diagram (Fig 1) sets out the above cultural ecology framework as a community action cycle. This is a system by which government and its agencies reach out to communities with strategies and financial allocations, through conservation management systems, to preserve and restore habitats and species to maintain natural capital. This is one input to cultural capital. The other input comes from the conservation management of provisioning services. These are the management systems by which government strategies and financial allocations add directly to cultural capital through improving jobs/homes etc. The improvements in natural capital and cultural capital are monitored and fed back to guide the development of government policy. We now think of our planetary survival kit in terms of the basic cultural capital, i.e. the social practices and objects acquired to make/improve social relationships/status, needed for human well being. This capital consists of meaningful local places, valued landscapes, physical and mental health, leisure, recreation and tourism, aesthetic and inspirational benefits, spiritual and religious benefits, cultural heritage and diversity, education and ecological knowledge. Cultural capital is supported by the basic ecosystem processes, which comprise our natural capital. Examples of ecosystem processes are weathering, decomposition, soil formation, nutrient and water cycling, macro-climate, evolutionary processes, ecological interactions with other living things and climate change. Natural capital is another way of describing the way in which rocks, soils and ecosystems underpin all the things that humans do. Natural Capital is needed in order to develop the cultural capital that we create. Since nature protection by definition is a social and political process, it stands to reason that our responses to the biodiversity crisis will have to focus on questions of human social organization to maintain a sustainable equilibrium between culture and ecology. We live off cultural capital by inventing provisioning services such as food production, including wild-caught resources (e.g. fish, honey, game), fibre/ timber/ minerals, fuel, bio-materials, water, and ornamental nature-goods. Provisioning services involve environmental management of natural capital. * respecting the environments physical and ecological limits; using, as individuals, only our fair share of the earth’s resources. ‘Over recent decades, humanity has benefited enormously from development, which has enriched our lives. However, much of this development has been associated with a decline in both the variety and extent of natural systems – of biodiversity. This loss of biodiversity, at the levels of ecosystems, species and genes, is of concern not just because of the important intrinsic value of nature, but also because it results in a decline in ‘ecosystem services’ which natural systems provide. These services include production of food, fuel, fibre and medicines, regulation of water, air and climate, maintenance of soil fertility, cycling of nutrients. In this context concern for biodiversity is integral to sustainable development. This ecosystem approach to manage human production was actually adopted by the world community as long ago as 1968 at the “Biosphere Conference” organized by UNESCO. This was the first intergovernmental conference examining how to reconcile the conservation of natural capital with the use of natural resources for economic development, thereby foreshadowing the present-day notion of sustainable development. This conference resulted in the launching of the UNESCO “Man and the Biosphere” (MAB) programme in 1970. One of the original MAB projects consisted in establishing a coordinated World Network of sites representing the main ecosystems of the planet in which genetic resources would be protected, and where research on ecosystems as well as monitoring and training work could be carried out. These sites were named “Biosphere Reserves”, in reference to the MAB programme itself. This tripartite view actually sets out the requirements of a conservation management curriculum for educating people in an ecological framework for living sustainably. The Convention on Biological Diversity in 2000 reaffirmed the definition as the primary framework for action under the Convention and it was endorsed by the World Summit on Sustainable Development in 2002. It recommends that ecosystem management should be central to sustainable development based on the multiple functions that ecosystems perform and the multiple uses that humans make of these functions. Human social evolution in the West has been a steady move away from dependence on local ecosystems to reliance on those of distant lands. Former cultures based on local provisioning services, such as fishing, have been shorn of their cultural roots in the local natural capital by unmanaged exploitation. * It operates on large scales or “Landscapes”. Conservation should consider the structure, functions, and dynamism of the ecosystems. Ecosystem managers should set long-term objectives considering the effects on adjacent and other ecosystems. These holistic approaches call for balance between the different forces at play in the landscape and also call for environmental considerations to be integrated with the different sectoral policies. This can also be considered as an attempt to integrate conservation and development at the landscape level. * It addresses the root causes of biodiversity loss. Ecosystem managers should address the economic drivers adversely affecting biodiversity, align incentives to promote an appropriate balance and the integration of conservation and the sustainable use of biodiversity, as well as internalise costs and benefits. * It involves a wide range of relevant actors. There should be the decentralization of management to involve the lowest level, and consideration of the different societal choices and knowledge to be made from a community level. 2. Management should be decentralised to the lowest appropriate level. c. Internalise costs and benefits in the given ecosystem to the extent feasible. 8. Recognising the varying temporal scales and lag-effects that characterise ecosystem processes, objectives for ecosystem management should be set for the long term. 9. Management must recognise that change is inevitable. 11. The ecosystem approach should consider all forms of relevant information, including scientific, indigenous and local knowledge, innovations and practices. In ecology, sustainability describes how biological systems remain diverse and productive over time. This is a necessary precondition for human well-being. Long-lived and diverse wetlands and forests are examples of sustainable biological systems. Sustainability is also the human capacity to endure and conservation management is the tool by which humans, as part of nature, are able to guarantee the long-term maintenance of well being. Well being has economic, and social dimensions as well as ecological ones, and encompasses the concept of union, an interdependent relationship and mutual responsible position with all living and non living things on Earth. This philosophical interpretation of conservation moves well beyond definitions driven by progress-oriented economic perspectives that see humans as providing stewardship through the responsible management of habitats and species. Taking this wider view of conservation, there are two major ways of managing human impact on ecosystem services. One approach is management of natural capital; this approach is based largely on information gained from earth science, biology, and ecology. Another approach is management of the provisioning services underlying the consumption of resources, which is based largely on information gained from the economics of social justice. Human sustainability interfaces with social justice through the social and ecological consequences of economic activity. Conservation management for sustainability has to address this challenge of cultural ecology by controlling factors in the domains of international and national law, urban planning and transport, local and individual lifestyles and ethical consumerism. Conservation management for living more sustainably can take many forms from reorganising living conditions (e.g., ecovillages, transition towns and sustainable cities), to reappraising work practices (e.g., using permaculture, green building, sustainable agriculture), or developing new technologies that reduce the consumption of resources. At the heart of the history of modern Wales is the exhaustion of the massive coal deposits which kick-started the industrial revolution and led to the rise and fall of mining, mineral and metal working cultures. In this context it is not surprising that the long-standing international/European recommendation for cultural ecology to be at the heart of sustainable development was picked up by the Welsh Government in 2009 and published as a strategic document ‘A Living Wales’. ‘A Living Wales’ is so-called in part because it seeks to create a real linkage between Wales’ many existing strategies, plans and policies aimed at producing synergistic, sustainable development benefits. This requires a matrix of the aims, objectives and grant giving programmes of all agencies that have an input to managing the country’s Green and Blue Infrastructure. They may all then be focused on communities in a landscape. Those, such as River Basin Management Plans, the Wales Woodland Strategy, Glastir (a Welsh farming/wildlife scheme), and Local Development and National Park Management Plans, and several relevant technical advice notes to planning authorities (TANS), are already in place or soon to be so. Just as important will be the Rural Development Plan, the Climate Change Strategy, the Wales Spatial Plan and forthcoming Marine Policy Statement and Marine Spatial Plan for Welsh waters, and the developing National Infrastructure Plan and Networked Environment Regions initiative. Policies and strategies for Food and Farming, Transport, Economy, Regeneration, Health and Education have a vital role to play. A Living Wales is now being progressed as the Government’s Natural Environment Framework (NEF). The amalgamation of the three government agencies responsible for habitats and wildlife, forestry and other environmental services will be part and parcel of the aim of embedding sustainable development as an objective in all policy and its delivery. One of the vital characteristics of holistic community work at the landscape level, whether it is a local housing estate or a watershed catchment, is that landscape management is ‘people’ centred. This is important because people are an integral element of the landscape and hence should be widely involved with its management for their benefit. 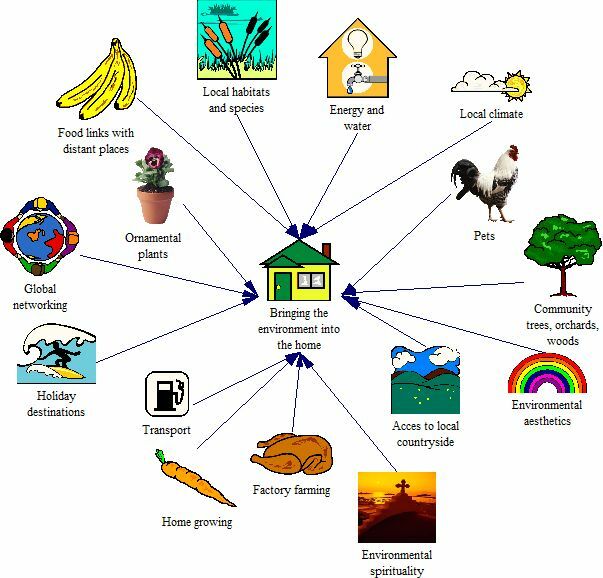 Although a local natural environment framework governing livelihoods cannot be incorporated directly into home life as it used to be for fisher families and semi-self sufficient country folk, there are still many indirect routes to draw environment and home together (Fig 2). A strong body of psychological research, supported by widespread anecdotal evidence, confirms the hypothesis that mental contact with our dependence on nature leads to increased mental health and psychological development. This research helps explain the attraction of parks and tree lined streets for city-dwellers and supports the value of increasing contact with nature for children and adults. Research settings include a full range of encounters with nature on holiday, walking in a tree-lined streets, neighbourhood open space or a local nature reserve, playing in a city park or backyard, gardening, tending a small plot of urban grass or a vacant city lot with its attendant ecosystem, and even watching nature scenes on TV. While different psychological approaches (evolutionary, behavioural, cognitive, psychodynamic, systems-based, humanistic, and transpersonal) focus on different aspects of the psychological benefits of nature experiences, all have shown that nature experiences, direct or indirect, are desirable and healthy. This is phenomenal agreement! There is also limited, but suggestive, research that these findings are cross-cultural and universal. This kind of environmental education was defined by the UNESCO Tbilisi Declaration in 1978 as being based on a sub-liminal learning process that increases people’s knowledge and awareness about the environment and associated challenges, develops the necessary skills and expertise to address the challenges, and fosters attitudes, motivations, and commitments to make informed decisions and take responsible local and international action. No doubt this educational experience can be re-enforced by social marketing; a challeng to embed NEF in Welsh homes. As society struggles to come to grips with increasing degradation of the land, its resources, and faltering ecosytems, all governments are realizing their limited resources and professional capacities, to assist social change towards a sustainable future. Increasingly, authorities from a variety of disciplines such as economics, social sciences and biological sciences, are also recognizing the limited capacities of traditional forms of compartmentated public sector organization. Working across boundaries is required to deal effectively with the scale, complexity, and inter-relatedness of environmental problems for long-term sustainability. This recognition challenges the ability of governmental silo bureaucracies to adjust to, or engage, in more integrated on-ground models. Partnerships between government and communities at all levels are vital in the quest for integrated sustainable development and conservation with social and environmental justice. It is at the community level that all channels of advice, funding and services converge. The landscape model (Fig 3; Table 1) is an attempt to meet this challenge. It is a demonstration model of a citizens environmental network to encourage people to assemble an holistic view of communities and their habitats. It covers a small part of Wales centred on the watershed catchments of rivers running off the northern flank of Snowdonia. It includes the coastal valley landscapes of rivers from the Cegin (Maesgeirchen)to the Clwyd (Kinmel Bay). Picturing the functional topography of the units of communities and ecosystems moves the functional units of community programmes beyond a traditional narrow organisational focus for delivery. 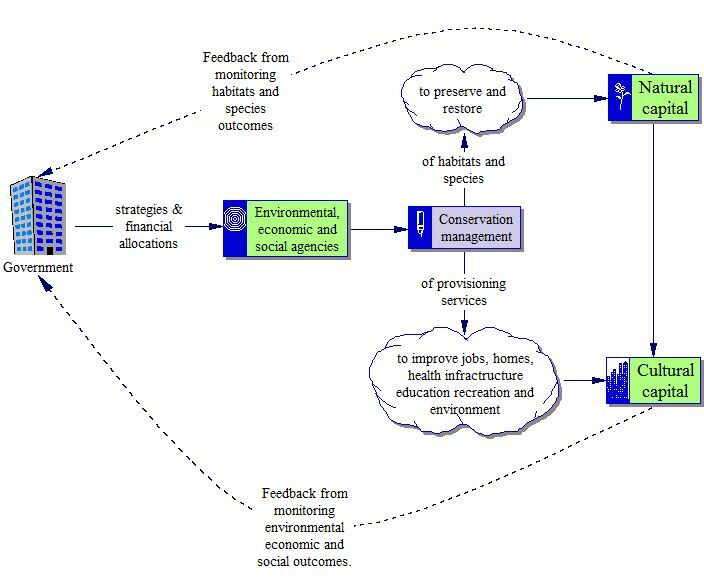 It requires evolution of providers and recipients towards a common conservation management curriculum. Such a knowledge framework can encourage the use of integrated multi-issue landscape models. A new definition of conservation management and holistic thinking can emerge coupled with bottom up negotiation and organizational learning whereby communities can present themselves to the world. This kind of landscape model has much common with UNESCOs biosphere reserves. The problem with the UNESCO designation, of which there are only nine in the UK, is that by so signalling an area, everywhere else is undervalued. The North Wales valley system is not a biosphere reserve, but nevertheless contains areas of riverine, upland and coastal ecosystems promoting solutions to reconcile the conservation of outstanding biodiversity with its sustainable use. As a living landscape unit it can serve in some ways as an integrated set of ‘living laboratories’ for testing out and demonstrating integrated management of land, water and biodiversity. The basic format is a knowledge framework and a set of software toolkits for integrating ecology, culture, education and sustainability to encourage the production of community action plans with the outcomes being reported on line in community wikis. In this context, conservation management is equated with planning for sustainability in all aspects of community life and any neighbourhood becomes a distinctive place worthy of environmental improvement. A community conservation management plan, can be modelled on the preservation or enhancement of its core green heritage assets, no matter how small. The plan can then be developed for other community assets, such as transport, security, energy use, tidiness, and opportunities for employment and recreation. It consists of a development of the Google geographical information system, called Community Walks, to which existing Wikipedia entries of actual communities are attached. A “wiki” is an interlinked set of Web pages written by the people who use it: the beauty of a wiki is that anyone can edit and contribute. Wiki Spot is another nonprofit, member-supported effort, dedicated to helping communities use wikis and connect them on line to create a citizens environmental network. In the UK Strategy for Sustainable Development, the idea of a ‘citizen’s environmental network’ was proposed as a way of helping communities make action plans and tell others about their ideas and achievements. the inadequacies of paper systems to centralise management, recording, and communication. To remove these limitations requires access to feedback from the experiences of many communities. This GIS networking promotes the rapid development of ideas and methods to promote environmental appraisal and the long-term management of neighbourhood historical assets, green spaces and home and community services. The overall outcome is the promulgation of a sense of place, improvements in quality of life, reduction in environmental impacts of day to day living, and the enhancement of biodiversity. This entry was posted on Tuesday, December 6th, 2011 at 03:46 pm and is filed under Uncategorised. You can follow any responses to this entry through the RSS 2.0 feed. Both comments and pings are currently closed.